Many thanks to Macromedia for supporting Radio in the latest release of Dreamweaver. "For Dreamweaver MX developers, the kit contains extensions for website building and application development. The extensions help display data in PHP applications, add functions to the file menu in Dreamweaver, and edit themes for sites developed using Radio Userland for editing weblogs." 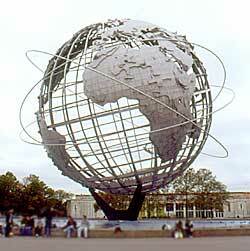 I grew up ten blocks from the World's Fair that Doc and Halley are dreaming about. I wish we could have gone together, the three of us. We could have ridden the monorail through the prehistoric swamp with dinosaurs at the Ford pavillion. Or ate waffles with strawberries at the Belgian Congo. Or glimpsed the future as seen through the eyes of GM. They gave out radioactive badges that glow in the dark. Or come back in 1965 to catch one of the first games at then-new Shea Stadium. There were lots of "ramas" at the end of names of things back in 1964. It would have been Dave-O-Rama and Doc-O-Rama, and Halley-O-Rama. Imho, the most patriotic thing a US citizen can do on Sept 11 is something that has nothing to do with Sept 11. And to reporters who are already in meta-meta-news mode on this (in other words news about news about news), here's a good filter to apply when deciding if you should report on something. Was there actually any news? If so, go ahead. If not, skip it. Doc found a pointer to the Frontline show about faith and doubt at ground zero. Good morning. I have started to implement the changes outlined below. Please only review the doc if you have a high tolerance for confusion and want to help. First, I've added the section explaining how to extend RSS through namespaces. I'm basically telling you to ask the W3C how namespaces work, and do it the way they tell you to do it. I don't want to assume the problem of documenting namespaces in the RSS spec. Then I modified the roadmap, it got a lot simpler. No more innovation. RSS is frozen. Only minor adjustments are contemplated. I learned this lesson in the XML-RPC spec process, it would have been a good idea to set the expectation that there would be tiny little almost insignificant tweaks, to make those possible without opening the door to rewriting the whole world. Live and learn. The next thing to do is read and review and think and listen, and then do the global search and replace. I'm going to enjoy doing that. Mark Pilgrim: "This is a brief history of RSS from July 2000 to November 2000, during which time RSS 0.9x and RSS 1.0 forked. I try to focus on specific people and conversations that document why the fork occurred. I was not involved in any of this, but much (not all) of the discussion has been publicly archived." Yesterday I posted a note on Scripting News saying that, unless there were any objections, I would add support for namespaces to the RSS 0.94 specification. There weren't any objections, in fact there was a lot of enthusiasm for the idea. And further, there's talk all over the place about RSS 2.0, a belief that now's the time to really get RSS on a strong foundation, one that's solid and frozen, and at the same time extensible. So I stayed up late, until the midnight page-flip, to post a list of steps I want to implement that will result in RSS 2.0, in the next few days, with an anticipated 2.01 and possibly 2.02 shortly thereafter. 1. Clean up the RSS 0.94 specification by doing light edits and removing the type attribute for <description>. I feel at this time that it is a mistake to add confusion to the all-important description element. Thanks to Sam Ruby for pushing this. Also clarify the distinction between link and guids that are permalinks. There's some confusion about the difference. Probably a few other things to deal with too. 2. Add a new section explaining how RSS can be extended with namespaces. 3. Change the title of the spec to RSS 2.0. Do a search for 0.94 and replace with 2.0. 4. Update the roadmap. Namespace support is no longer in the future, the core of RSS is frozen, no features are deprecated (explain why), there may be a 2.01 and 2.02, for the purpose of clarification, but no new core elements are anticipated. 5. Update the change notes. Indicate that 0.94 was not deployed. Move the changes from 0.94 to a new heading entitled 2.0. 6. Allow a brief period for comment and accolades. 7. If there are no objections, remove the caveat from the specification, and declare RSS 2.0 ready to deploy. Encourage developers of all content systems, especially Movable Type, Blogger and Radio UserLand, to support the new format; and aggregators (Amphetadesk, NetNewsWire, Aggie, Radio). Ben Hammersley can finish his book. People can write BDGs, howtos, magazine articles. Jeff Barr and Bill Kearney can help people debug their feeds and track progress on 2.0 in the installed base. Mike Krus can generate thousands of RSS 2.0 feeds. Someone can write an RSS to RDF converter app. Mark Pilgrim can explain how RSS benefits people with disabilities. We need a volunteer to maintain a directory of products and services that support RSS (hopefully in OPML). Perhaps it's time for a new mail list with a fresh charter? Sam Ruby, Mark Pilgrim and Jon Udell can be satisfied in having helped get an important format back on its feet, and I can go look for a new techno-political mountain to climb, satisfied that RSS will have a productive life ahead without being so controversial and time-consuming. Important note: I'm sure I left a lot of important people out of the list in section 7 above. I stayed up late to write this (actually I couldn't get to sleep I was so excited). It's very important to get a complete credits page up, so that people who make a contribution to the community are properly credited for their work. Last update: Monday, September 06, 2004 at 9:26 AM Eastern.